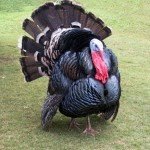 So with Thanksgiving right around the corner I have been really wanting to do a super cool "turkey" inspired science experiment with the kids. I tell you what I love the internet and after a little bit of web surfing found this really neat idea. I have not done it yet but I'm looking forward to it. Clean off all the excess meat from the chicken bone. Talk to your children about the bone, have them touch the bone and discuss if it is hard or if it is soft. Discussion is key to every experiment. Pour vinegar into the jar. Place in the bones and leave overnight. If they are thin enough, the experiment should only take a day but if they aren’t really thin, it will take about two or three days. Make sure everyone washes their hands. Remove the turkey bones from the vinegar. They should be soft and bendable. Discuss what has happened to them. Allow your children to touch them and bend them. Tie the bones into knots. You can tie them together or simply place knots in each bone. Sometimes the bones will slide out of the knot so I find just placing a clip on either end keeps them secure. Leave the bones overnight (this should only take one night but check the bones before you pull them out for the last stage. Take out the bones and explore them. Remove any clips if you used them. The bones should be hard, and back to normal except that they are now knotted. So just so you can explain to your child(ren) what has happened, let’s look at the science behind this experiment. Obviously, the main answer is that we are dealing with a chemical reaction when we do this experiment. Bones contain a substance called “calcium carbonate” and it is this substance that causes the bones to remain hard. When you add vinegar, which is a acetic acid, the chemical reaction occurs. 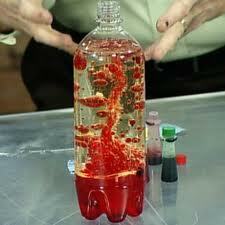 Carbon dioxide is created and you should see it in the vinegar as tiny bubbles. The carbon is taken from the bones and they begin to soften. When there is no longer any carbon in the bones, the bones can be bent and tied without fear of breaking them. Now for the really interesting part. Since carbon is in the air around us, it is very easy for the reverse reaction to occur. When you leave the turkey bone out for the night, the calcium that is still in the bone takes the carbon back into the bone. This makes the bone hard again and since you had reshaped it, it will harden into whatever shape you created. So in essence, you get two reactions in one experiment and a whole new way to look at turkey dinner. So my daughter was at a friends house last weekend. When she come home she was telling me how she wanted to go buy a lava lamp, because her friend had one! I thought to myself, "We can make one of those, I know it!" So I got online and found a website that had a lava lamp recipe. My daughter was really into the idea of making this. So pretty much what we did was mixed some water and baby oil with a few drops of food coloring in a plastic bottle for some lava lamp action. 1. Fill the bottle three fourths (3/4) of the way with vegetable oil. 2. Fill the rest of the bottle with colored water. 3. Close the lid tightly. 4. Turn the bottle on its side – watch as the color moves through the oil in funny shapes and blobs. The water and the oil do not mix because the water has more density than the oil.